Apple iPhone 7, HTC U11, Google Pixel, Huawei P10, LG G6 Samsung Galaxy S8, Sony XZ Premium: which is your favourite? The Phone of the Year 2017 is brought to you in association with Gear4. 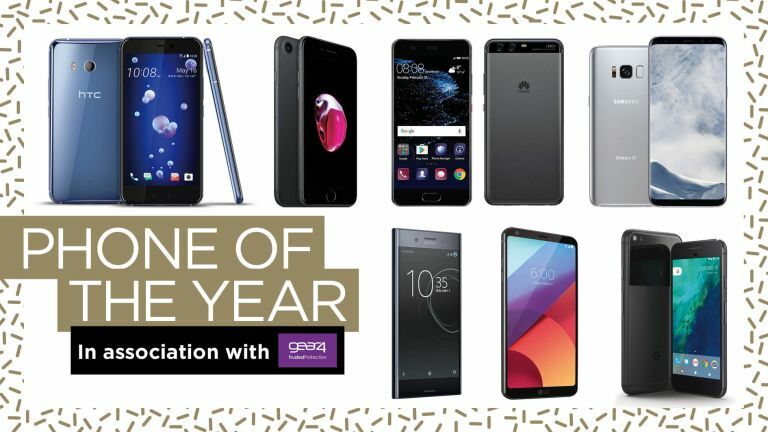 Although many of our awards will be voted for by an expert panel, we asked you to vote for our reader-voted categories including Gadget of the Year, Brand of the Year and Retailer of the Year as well as Phone of the Year - this is now closed. Choose from Apple's iPhone 7 which took the iPhone brand from strength-to-strength. There's the innovative and sleek HTC U11, Google's Pixel with its superb camera, Huawei's super P10, the return to form that was the LG G6. Then there's Samsung's classy Galaxy S8 and last but not least Sony's new XZ Premium - a proper Sony flagship phone at last. Samsung also snagged three awards last year, picking up Brand of the Year, Wearable Technology of the Year for its Gear S2 smartwatch and Phone of the Year for the Galaxy S7 Edge. As part of the T3 Awards' 10-year celebration in 2016, a one-time Gadget of the Decade award was given to the Apple iPhone, voted for by you. Buy our phones of the year! However, on the following key categories YOU got to vote: Gadget Of The Year, Brand Of The Year, Retailer Of The Year and Phone of the Year.